· To move or to be directed away from a center or axis. · To chew or to grind or to knead into a pulp. How does a Centrifugal Juicer work? A Centrifugal Juicer is one of the most common types of juicers you will find on the market and is typically designed with a center feed chute where you put in your fruit or vegetables to be juiced. When switched on, the Centrifugal Juicer spins at high speeds, taking the fruit or vegetables from the center chute, with the fast spinning action bringing the fruit or vegetables to a pulp and forcing the juice out through a spout into a glass or bowl. 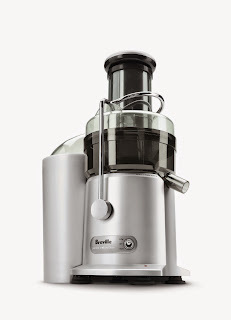 How does a Masticating Juicer work? 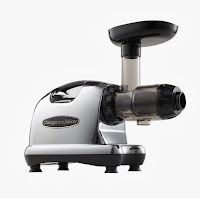 A Masticating Juicer does not have the spinning action of a Centrifugal Juicer and works at much lower speeds than a Centrifugal Juicer. Instead, it slowly grinds/squeezes fruits and vegetables much like the action of chewing your food so the juice is slowly squeezed out. 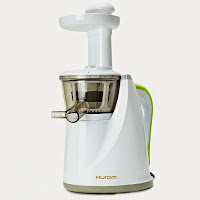 Because of the way Masticating Juicers work, they tend to be more efficient than Centrifugal Juicers and are capable of extracting more juice, with some juicers like the Hurom HU-100 Masticating Slow Juicer claiming to extract up to 35% more juice from your fruits and vegetables compared to traditional high-speed Centrifugal Juicers. In addition, the slow grinding/squeezing action of Masticating Juicers helps to retain more nutrients from the juice than Centrifugal Juicers. This is because the high-speed action of Centrifugal Juicers causes friction which tends to create more heat which can damage or destroy essential nutrients and enzymes in the fruits or vegetables. The difference in the way the 2 juicers work also affects the oxidation process of the fruits and vegetables. The low speed of Masticating Juicers helps to slow down the oxidation process to help prevent the deterioration of nutrients and enzymes in your fruit and vegetables as you’re juicing them. Masticating Juicers can therefore produce more flavorsome and more nutritious juice than Centrifugal Juicers. Masticating Juicers are also better at juicing leafy green vegetables like wheatgrass, spinach, kale and more. They can also be used for other purposes, like making milks, sauces, marinades and baby food for example. N.B. It's always advisable to consult your doctor or health care professional if you have any concerns regarding your health or nutritional intake. Prices/discounts indicated correct at time of writing/publishing. E&OE.